LITTLE FORK LAKE - Historic Three Lakes Chain Legacy Property is now being offered for the first time. This Hemlock forest lake lot has 6.5 rolling acres and is stretched over 960 feet of beautiful sand frontage at the entrance to Little Fork Lake - in the middle of the chain. 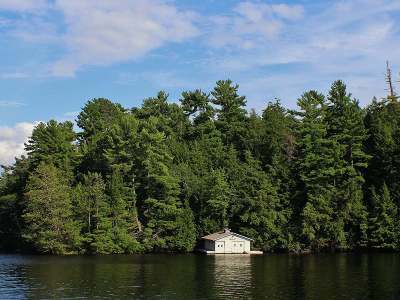 This property is the coveted point at the Blue Ribbon Bridge known by its 2 stall wet boathouse surrounded by woods, as is the classic cabin at the top of the hill. This allows for panoramic views from almost every room. Stepping into the cabin is like stepping back in time to a slower pace with time to sit on the screened porch and read, reminisce with friends in front of the huge living room window while warmed by the fire in the stone fireplace and gazing over the woods and water while surrounded by log beams and knotty pine interior. This parcel can be subdivided or kept for you future generations to enjoy. Call for the many more details today.